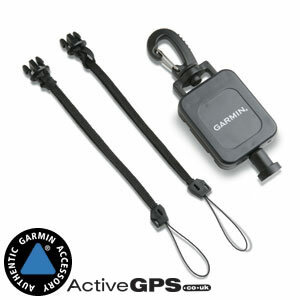 Keep your Garmin handheld GPS system safe, while within easy reach with this retractable lanyard. Simply clip one end to a fixed point e.g. your trouser belt loop and the other end to your Garmin Montana, eTrex, Oregon or other outdoor device and you are ready to use. The retractable lanyard provides up to 28-inch (71cm) extension. Meaning you can easily view the units screen, while the lanyard is still attached to your person or other fixed point. This genuine Garmin lanyard kit also includes two quick connect lanyards. Ideal if you have a second unit or just to keep as a spare. Compatibility: Compatible with Garmin handheld range. If you require your Garmin handheld unit to be detached from the retractable lanyard, you can with ease thanks to the quick release connection. All mounting solutions are genuine Garmin accessories and can be purchased from ActiveGPS. What is the retractable lanyard compatible with? Garmin Atemos 100/K 5, Atemos 50 and K 5, Approach G3, G5, Colorado 300, Dakota 10, 20, eTrex 10, 20, 20x, 30, 30x, Touch 25, Touch 35, Camo, H, Legend, Legend C, Legend Cx, Legend H, Legend HCx, Summit, Summit HC, Venture, Venture Cx, Venture HC, Vista, Vista C, Vista Cx, Vista H, Vista HCx, Geko 201, 301, GPS 72H, 73, 76, GPSMAP 60, 60Csx, 60Cx, 62, 62s, 62sc, 62st, 62stc, 64, 64s, 64st, 66s, 66st, 76, 78, 78s, inReach Explorer+, SE+, Oregon 200, 300, 400t, 450, 450t, 550, 550t, 600, 600t, 650, 650t, 700, 750, 750t, Montana 600, 600t, 610, 610t, 650, 650t, 680, 680t, Monterra.